GT-30is an alkaline, aqueous dispersion of colloidal silica that is approximately 30% solids by weight. The silica dispersion is sodium stabilized and the amorphous silica particles carry a negative surface charge. The SiO2particles are discrete, have a slightly rough, spherical shape, and are present in a narrow particle size distribution. The physical appearance of the dispersion is a translucent liquid, slightly more viscous than water. GT-30 is produced for world-wide ditribution. GT-30 is a versatile product that has many different application and functions. GT-30 should be transported and stored at a temperature of 5-35℃(40-95oF). 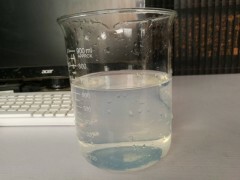 If the silica dispersion is allowed to freeze, the silica will irreversably precipitate. For bulk storage, the tank should be sealed and constructed of plastic, fiberglass reinforced plastic, or stainless steel. For packaged goods, any translucent packages should be stored out of direct sunlight or bright light. Under recommended conditions, GT-30 has a shelf life of at least twelve months after production. GT-30 is available in bulk and packaged quantities. Bulk shipping and packaging sizes can vary by region. Before handling this material, review the corresponding Material Safety Data Sheet.